Greencol Taiwan Corporation's new bio-mono ethylene glycol plant is located in Kaohsiung, Taiwan. The new plant produces 100,000t of bio-MEG a year. With the construction of the new plant, Toyota aims to establish a global integrated supply chain for bio-PET. Global demand for bio-PET is estimated to reach 6.74 million tons by 2023. 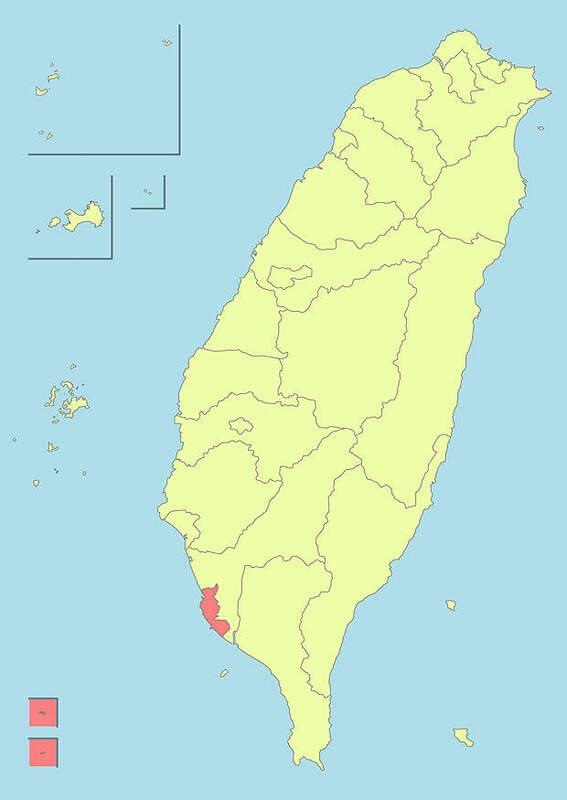 Greencol Taiwan Corporation (GTC) announced its plans to build a new plant to manufacture bio-mono ethylene glycol (bio-MEG) in Kaohsiung, Taiwan, in October 2010. The plant has a capacity of 100,000t per year, and was completed in 2013. Also acting as plant operator, GTC is a 50:50 joint venture between Nagoya-based Toyota Tsusho Corporation (TTC) and Taipei-based China Man-made Fiber Corporation. GTC is the first domestic manufacturer of bio-ethylene derivatives. TTC is responsible for the upstream and downstream activities of the new plant, handling the production and marketing of bio-PET. The company built a global integrated supply chain for bio-PET with the construction of the new plant. Bio-MEG produced at the plant is supplied to Asian PET manufacturers. TTC then off-takes the PET manufactured on a tolling basis and markets it to companies in Europe, Japan and the US. It also markets bio-PET based textiles for car interiors and develops bio-PET based bottles with customers. The company aims to increase the demand for bio-PET based sustainable products around the world. "With a capacity of 100,000t a year, the plant was completed in 2013." New Jersey-based Petron Scientech was selected as the process technology provider for the plant. The company specialises in commercially tested technologies for producing basic chemicals for industrial use. The plant uses Petron’s ethanol to bio-ethylene technology. Petron is also responsible for providing design and other services during and after construction. The new plant uses bio-ethanol produced from sugar cane as feedstock. Using ethanol for the production of PET is more economical compared to petroleum. Ethanol produces high-grade ethylene and has similar properties as that of petroleum-based ethylene. Plants that use ethanol can achieve incremental expansion of ethylene capacity at lower costs. In addition, the use of ethanol does not produce any of the by-products that are usually produced from petroleum feedstock. The bio-ethanol required is supplied by Petrobras, which signed a ten-year supply agreement with TTC in October 2010. Under the agreement, Petrobras Biocombustível, a subsidiary of Petrobras, annually supplies the new plant with 143,000m³ of ethanol. The $820m supply agreement is the first long-term agreement signed by Petrobras. "Bio-ethanol is supplied by Petrobras, which signed a ten-year supply agreement in October 2010." PET contains 70% PTA and 30% MEG. In Bio-PET, the 30% of MEG is replaced by bio-MEG made from sugar cane. Bio-PET is similar in quality to petroleum-based PET, but is more environmentally friendly. 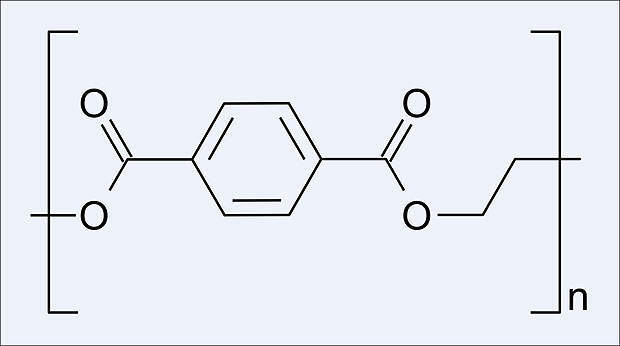 In the form of bio-ethylene oxide, it is used as an intermediate chemical for the production of a range of surfactants. As bio-ethylene glycol, it is used in antifreeze and PET pellets. North Carolina-based Chemtex International was awarded the engineering, construction and procurement contract for the plant. Biofuels and green downstream technology is a key business area of Chemtex. The company built the plant in partnership with Taipei-based Fu-Tai Engineering Company. PET is used in a variety of applications ranging from beverage bottles, food packaging films, textiles and vehicle interiors. "Bio-PET is similar in quality to petroleum-based PET, but is more environment-friendly." In 2009, global demand for PET was 45 million tons, and is expected to increase at an annual rate of 8.5% during 2014-2020. However, demand for sustainable alternatives to petroleum-based PET is growing steadily. 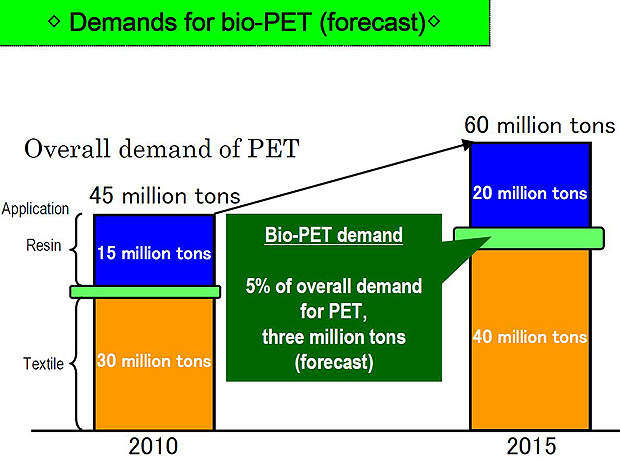 At present, only 490,000t of bio-PET is available in the market each year. Global demand for bio-PET is estimated to rise to six million tons a year, and is expected to account for 5% of the global market. TTC expects to tap into the projected gap in demand with the production and marketing of 200,000t of bio-PET.